Farmers can put up with some bad weather, but climate change will make unusual events more likely. 20-30% of plant and animal species will be more likely to become extinct if the temperature rises by more than 1.5-2.5C. There will be big effects on farming from droughts and floods. The biggest effects will be seen first near the Equator. Just being near the Equator makes it more difficult for countries to make economic progress. Hotter conditions affect how crops grow. Our agriculture is heavily reliant on grasses from the temperate regions. Corn, wheat, and rice are all types of grass. 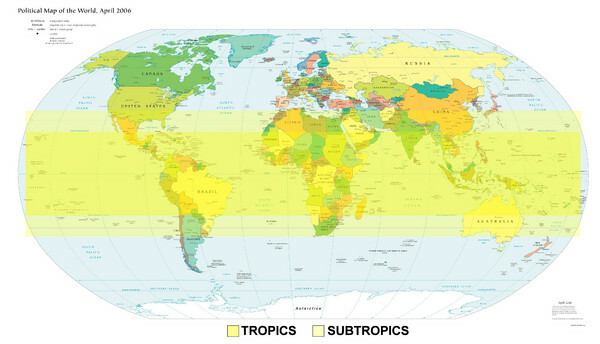 The Tropics will expand as the world warms, so the world will find it harder to grow those important crops. People will try to leave places where they cannot produce enough food. Countries where food prices rise rapidly tend to become unstable, making conflicts more likely. Global warming affects wheat production. A rise of 2 degree C in temperature is expected to reduce wheat yield by 15%. People who are struggling to cope with their food supply will move to cities, or aim to move to other countries, where they may not be welcome. Farming developed in the stable climate of the Holocene. "....the possibility of cultivation is not excluded for the late Pleistocene, however we argue that it did not become a reliable means of subsistence until the Holocene. This period coincides with a decrease in the amplitude of climatic oscillations ........"